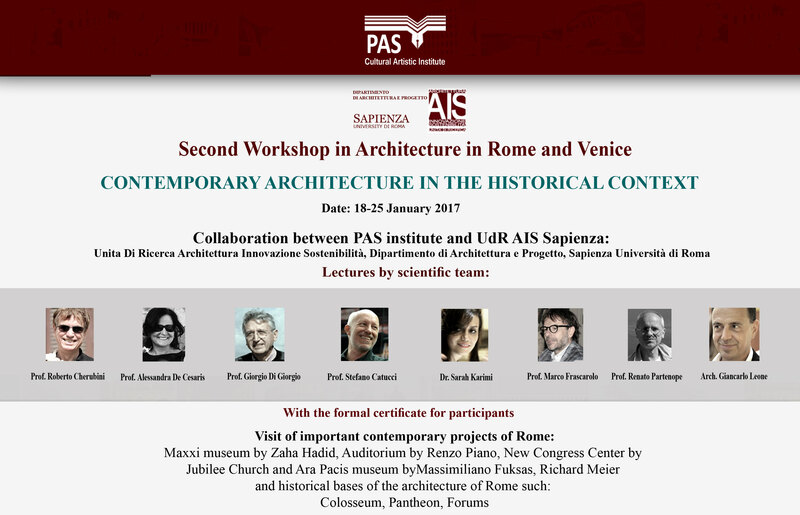 PAS institute is pleased to collaborate with UdR AIS Sapienza university of Rome in an architecture workshop, That is entitled “CONTEMPORARY ARCHITECTURE IN THE HISTORICAL CONTEXT”. This workshop is an introduction to the processes understanding of contemporary architecture in a historical context through lectures and visits. The role of natural light and artificial light is a fundamental element of contemporary architecture and therefore,one of the most important concepts of the workshop. The workshop is based on the theoretical knowledge provided through lectures by a team of nine skilled professors and real experience of space through visits. The visits Program includes important contemporary and historical architecture elements of Rome such Maxxi museum by Zaha Hadid, Auditorium by Renzo Piano, Nuvola, the congress center by Massimiliano Fuksas, Jubilee Church, Ara Pacis Museum by Richard Meier and Tiburtina station. Termini station, Colosseum, Pantheon, Forums, Piazza Venezia, Capitol hill, Ponte Milvio, Ponte musica and EUR are other clear examples. There is a specific meeting focused on the main topics as well, each day, at the end of the program. Participants will receive the official certificate of the workshop signed by Sapienza university of Rome and PAS institute.